Patricia has been working as a healer, channel and teacher since 1994 and after an incredible experience which took place on Table Mountain in 1998 begun working for Gaia, the consciousness of planet Earth. Pat channels Gaia, giving the Earth a voice. Patricia holds a vision in her heart where all of mankind realise that they are sacred beings upon a sacred planet and she holds this vision in all that she does. She supports people in awakening to themselves as divine beings, she supports people in opening their hearts for themselves and each other and she supports people in connecting to the earth and fulfilling their sacred journeys. To this end Patricia founded New Gaia Network, an organisation aimed at supporting people through Earth’s shifts into a new state of consciousness which is taking place over these next few years. New Gaia Network runs training courses “Footsteps of the Soul” which is recognised by The Complementary Therapists Association. She also runs enlightenment workshops called “Soul Journeys”. She is editor of Dragon’s Talk the newsletter of New Gaia Network and has produced three channeling books. She currently works in the U.K and throughout Europe and South Africa. 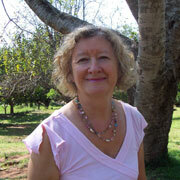 As a naturally gifted healer, Eloha's life experiences drew her to study and practise as a healer, channel and psychic. 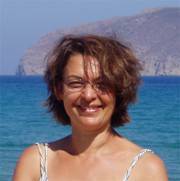 Since 1984, Eloha has been training and working with various techniques for her own healing and the healing of others, and has used her knowledge to affect transformation in the lives of many individuals. She channels Alcazar, a universal guide of great love, humour and wisdom in one-to-one sessions (in person or by phone) and in groups. Over the past 25 years she has developed her own unique processes working with the Chakras and with Past Life Therapy. She offers one-to-one sessions and workshops - Rainbow Bridge of the Chakras (healing the wounded child within; core beliefs and soul retrieval) Past Life Therapy and Opening to Channel. Eloha works from her heart and knows that with the power of love we can bring about great transformation both personally and collectively. Eloha and Patricia have been co-facilitating Earth Connections and Sacred Journeys to Sacred Sites in different parts of the world since 2001. Eloha and Patricia always create a safe space for people to experience deep healing. They work in an energy of total unconditional love, holding each person they work with as a sacred, divine being, yet they also work with great humour and light.